2019 Grads: Book your photo session now! 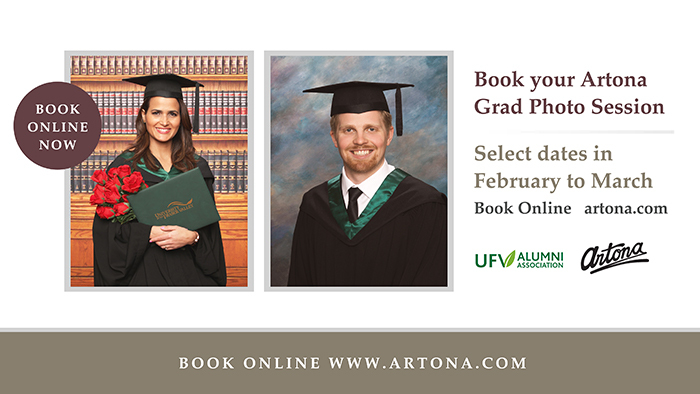 Professional photographers from Artona Group, the official graduation photographer for UFV, will be on the Abbotsford campus in February and March for graduate portrait sessions ($15 sitting fee). Book your session online. It is recommended that grads book their session now as appointments will fill up quickly. The School of Criminology & Criminal Justice, School of Business, the Faculty of Science, Health Sciences and the UFV Alumni Association are pleased to offer grads the chance to have a graduate portrait with their fellow grads framed together and mounted in their department hallway. This single headshot-composite photography opportunity is FREE for graduates.